While there are plenty of home cleaner products available at the store, making your own is still the best choice. Homemade cleaners only require simple ingredients from your pantry and can clean almost every part of your home. They’re safe for your family and even your pets. And compared to popular store cleaners that contain harmful ingredients, DIY cleaners are also a ton cheaper. So down below I’ve created a list of some of the best home cleaners that you can easily make. They’re super simple, non-toxic, and inexpensive. They’ll make your life easier and healthier. So check them out and let me know what you think! This easy glass cleaner can be whipped up in just a few seconds and costs just pennies to make. It only needs equal parts of rubbing alcohol and water, and a tablespoon of vinegar. It works well on glass and smooth surfaces. From scrubbing your kitchen sink to scouring your pots and pan, your kitchen needs a lot of cleaning. Luckily, this homemade kitchen scrub has got it covered. Just mix 5 drops of rosemary oil, 3 drops of water, and equal parts of natural dish soap and baking soda. Apply, scrub, and wipe off with a wet cloth. You’ll thank yourself later. It’s easy to overlook the shower-head while cleaning your bathroom. So to loosen the gunk that’s built up over time, just combine equal parts of hot water and white vinegar in a plastic bag then attach it to your shower head with a rubber band. Let it sit for at least several minutes and then wipe away. This dirt combo is no good in any room of the home. But thankfully you can easily get rid of them with just 3 ingredients: water, baking soda, and tea tree oil. In no time, you’ll have a clean space. If you have wood floors at home, this DIY cleaner is perfect for you. You will need a gallon of warm water, 1/2 cup white vinegar, and 2-3 drops of lemon essential oil. Mix and apply on your floor. Just be sure to use a barely damp cloth while washing your hardwood floors—if it’s too wet it could damage your floors. Here’s a cleaner that’ll make your countertops and table super clean. You’ll just need lemon or orange peels and two cups of white vinegar. Then simply pour the mixture into the spray bottle and make your kitchen smell amazing. Keep your garbage disposal clean and fresh by trying this tip out. To make one, put some rosemary, vinegar, and water in an ice cube tray and pop it into the freezer. When frozen, toss a few down your garbage disposal, and leave all the work to your natural cleaner. It’ll smell so fresh after each use! A natural, inexpensive, and effective way to clean your microwave is by using lemon juice and vinegar. Put the cup in the microwave, run for two minutes, and leave the door closed for several more minutes. Open the door after and wipe down all the gunk and dirt. Try this recipe and make your bathroom smell fresh and clean. All you need is baking soda, your choice of essential oil, and an old jar with a lid that you don’t mind poking holes in. Place the jar in the corner of your room, shake, and you’ll have an amazing smell. What could be better than an all-purpose cleaner? With just a little bit of baking soda, dish soap, and white vinegar (along with water which is already free) you can easily make a home cleaner perfect for almost all parts of your home. Make a batch, store it, and you’ll save so much money. Whether it’s spring or not, cleaning your home always needs to happen. From getting rid of the dirt in your kitchen to disinfecting your bathroom, keeping your home clean and disinfected is very important. 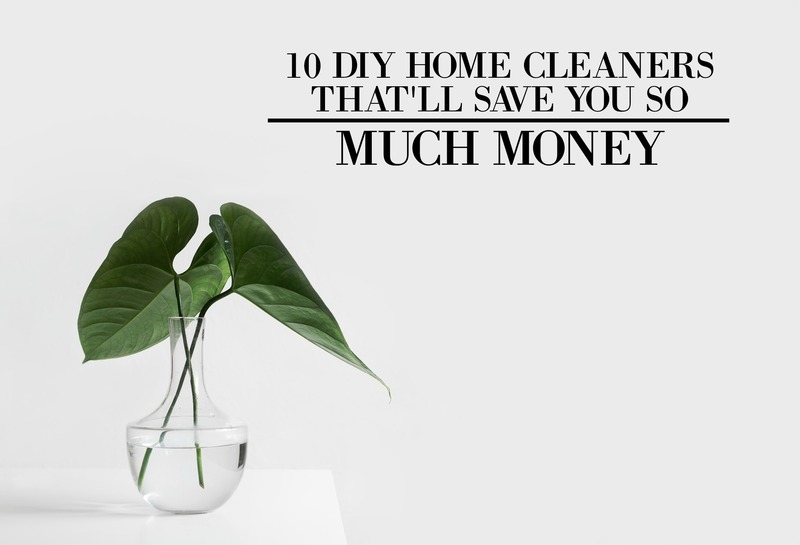 And the idea that you can save money and make your own home cleaners that comes toxin-free, means it’s a total win. So give them a try and let me know what you think! Now, If you have any questions about these tips, comment down below, I’d love to help you out!